Everyone! Please be careful not to offend Sri Krishna’s most merciful and powerful, sweet, ever-present loving form as the Hare Krishna maha-mantra. In Kali-yuga, Sri Krishna Nama is our only hope—our only chance, and the only way we’ll ever attain the plane of love divine desired by all. Worship Krishna Nama! Protect Krishna Nama! Cherish Krishna Nama! Chant Krishna Nama! Give Krishna Nama! Live Krishna Nama and depart with Krishna Nama! And by all means never, never, ever offend Krishna Nama! In Bhakti-sandarbha (anu. 154-159), Sri Jiva Goswamipada describes five prominent effects of offensively chanting Sri Krishna’s transcendental names i.e. Hare Krishna maha-mantra. The five effects are as follows: crookedness; faithlessness; absorption in mundane objects that erode one’s faith in Krishna; slackness in devotional service; and pride. Offenders to nama gradually become faithless, lose their conviction about the glories of Krishna bhakti, and start harboring contrary non-devotional ideas. 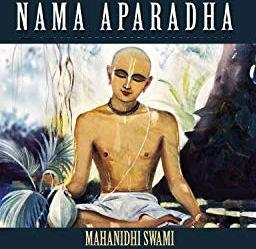 Nama aparadhis become absorbed in material objects and pursuits i.e. making money, attaining degrees, etc. that erode their faith in Krishna and Krishna bhakti. As a result of Nama aparadhas, one’s bhakti bhajan wanes and one again becomes absorbed in sense gratification—maya! One thinks excessively about one’s own bodily happiness and distress and that of others. Suddha Nama ki jai! Namacarya Sri Haridasa Thakura ki jai! Sri Jiva Goswamipada ki jai! Jai Jai Sri Radhe! His Divine Grace A.C. Bhaktivedanta Swami Prabhupada Mini Biography of the... Do We Have Free Will?